Outplay your friends in 90 seconds! Flip the lid and time! This game has been around for many years now. Scrabble lovers should enjoy this just as much. 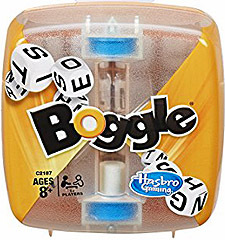 You simply shake the dice, then connect the letters to make words against the clock. At times up, players compare lists and cross off any duplicates they have, scoring the unique words that are left. Good family fun.